Casinos put Las Vegas on the map, but the city wants the world to know gambling isn't all that Vegas offers. Nevada's entertainment capital brought some of their top chefs to Belgium for Tomorrowland; unveiling a new concept that combines "bites" and "beats" for the thousands in attendance. 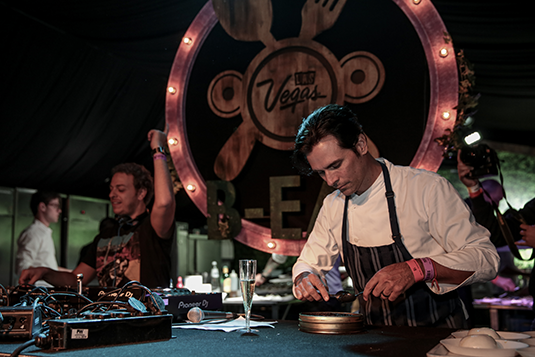 Las Vegas' B-EAT stage paired DJs with culinary artists, fusing a three-course tasting menu with 60 minutes of music. Both chef and DJ performed side-by-side, serving up their best. Vini Vici, whose remix of "Hilight Tribe - Free Tibet" racked up over 31 million YouTube views, shared the spotlight with MGM Resorts International Corporate Executive Chef Anthony Amoroso. Amoroso, a former executive chef at Mina's SeaBlue in Atlantic City, offered an oceanic-based cuisine that included caviar and sushi. Diners were also treated to a champagne toast. The Vegas B-EAT marks the first time an entire city sponsored a stage at Tomorrowland. Cathy Tull, Senior Vice President of Marketing at the Las Vegas Convention and Visitors Authority, hinted that her city and the three-day music festival were natural partners. Tomorrowland is probably the most famous three-day electronic music festival in the world, welcoming people from 198 countries this year alone. The event features multiple stages to satisfy the musical tastes of everyone.